[UPDATED August 2016] Ukraine has one of the world’s lowest fertility rates and one of the highest abortion rates. The cause of abortion is clear: the intersection of low desired fertility and the non-use, ineffective use, and inappropriate use of modern contraception. Myths and misinformation are major barriers to modern contraceptive use. “Hormone phobia” is particularly prevalent, with many women afraid to use hormonal methods; misinformation about IUDs is widespread. 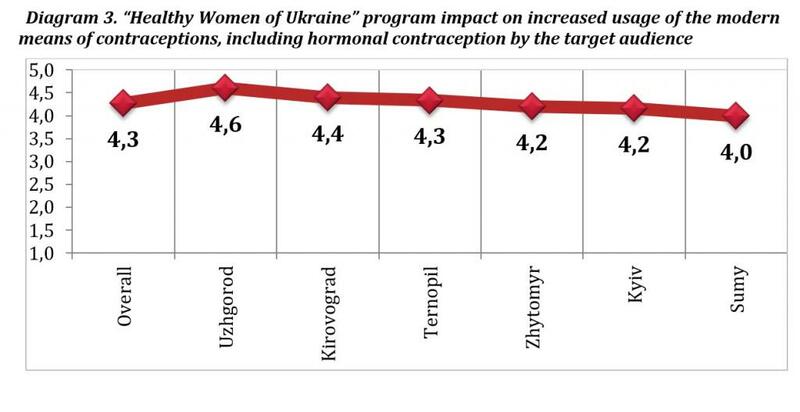 Only 3.7% of Ukrainian women of reproductive age use contraceptive pills and 12.1% use IUDs. The number of abortions per 1,000 live births in Ukraine in 2008 was 400 compared to 238 for European countries. JSI’s Healthy Women of Ukraine Program (HWUP), designed as a five-year family planning and reproductive health (FP/RH) program (2011-2016), developed the first national, multi-stakeholder FP communication strategy to increase positive attitudes and expand the use of modern contraceptives as an alternative to unintended pregnancy and associated abortion. Previous efforts by government and NGOs to change family planning attitudes and behaviors among women of reproductive age and their partners lacked coordination and a national approach. JSI developed the national communication strategy as a joint action plan for government (national and regional), donors, NGOs, and other stakeholders to reach audiences with key family planning messages. Using jointly developed messages and one logo, the strategy partners agreed to use and promote the same national communication channels (e.g. website, hotline, social media, TV/radio, outdoor advertising, IEC materials, training modules). Oblast governments developed complementary regional-level strategies, which increased reach among target audiences and bolstered local ownership and sustainability. To determine the main communication challenges that needed to be addressed by the strategy, HWUP conducted a desk review and facilitated a series of meetings with key FP stakeholders in Ukraine. 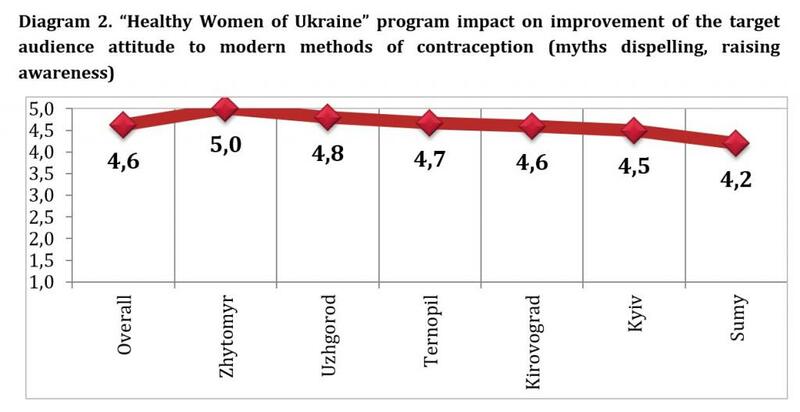 Awareness about modern contraceptive methods is high among the population of Ukraine, but knowledge is superficial, and contraceptive use is not consistent and sometimes ineffective (USAID Knowledge, Attitudes and Practices Assessment (KAPA), 2010). Ineffective use of contraception leads to a high abortion rate; about one third of pregnancies end in abortion (Ukraine Ministry of Health (MOH), 2010). Of pregnancies ending in abortion, 24% had been using modern methods and 42% had been using traditional methods. 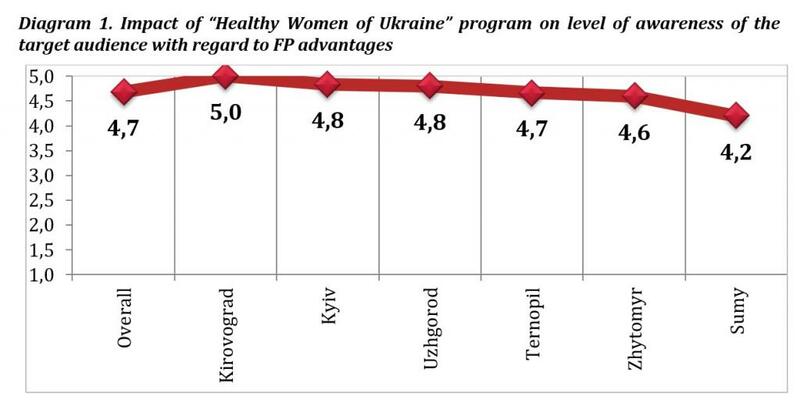 This signals a failure to use modern effective methods (Ukraine Demographic Health Survey (UDHS), 2007). Myths and misinformation are the major barriers to modern contraception use. “Hormone phobia” is particularly prevalent, with many women afraid to use hormonal methods. Misinformation about IUDs is widespread (USAID KAPA, 2010). Only 3.7% of Ukrainian women of reproductive age use contraceptive pills and only 12.1% use IUDs (UDHS, 2007). Contrary to what one would expect, health providers, particularly gynecologists, are often the conduits of misinformation. Their knowledge is often out of date and inconsistent with evidence-based international norms. Financial incentives can sometimes bias the information they provide to women (USAID KAPA 2010). The cost of contraception does not appear to be a serious deterrent for women of middle income levels and above (USAID KAPA 2010). Current use of modern contraceptives, from 2007 DHS survey. Once the desk review and stakeholders’ meetings were complete, JSI analyzed the results to determine the best way to design the national FP communication strategy. Ukraine had previously lacked a coordinated and national approach to target information to the general public and to population groups at high risk of abortions and unintended pregnancies. Although in the past both the government of Ukraine and NGOs made attempts to reach target population groups through specific actions, a common agenda for action to change attitudes and behaviors was not in place. For these reasons, JSI decided to involve a range of national partners and designed the strategy specifically to attract additional resources, thus ensuring national level coverage and impact. The strategy employs the life stages approach*, which addresses the needs of the intended audience at each stage of their life cycle. This is innovative for Ukraine and relatively easy to communicate to both users and providers. Since it is common in Ukraine that women will resort to abortion, FP programs also need to stress quality and informed choice. JSI's approach is that the first step is to get individuals and/or couples to have positive attitudes about modern contraceptive methods. The second step is to enable couples to access easily the necessary information and health services needed to choose, obtain, and use a method effectively. As displayed in the visual below, the strategy uses various communication tools in the form of media and direct communication activities (top left box) to create demand for and “drive traffic” to the website and the hotline, where audiences can access more information. JSI presented the first draft of the national FP communication strategy at a Reproductive Health Partners Group meeting. The Reproductive Health Partners Group brings together public health experts from key organizations working in the area, including WHO, UNFPA, UNICEF, UNAIDS, and HIV Alliance. The draft of the national FP communication strategy was approved by all the participants at the meeting, which also served to create buy-in and ownership among the Reproductive Health Partners Group members. Ukraine’s national FP communication strategy uses a variety of channels to deliver consistent messages to target audiences. The purpose of the website and hotline is to provide up-to-date, evidence based, and user friendly information about the benefits of FP and the range of modern contraceptive methods available in Ukraine. Users with the intention to use modern contraceptives will be better equipped, empowered and encouraged to consult with their health providers to make the right choice for themselves and their families. In addition to media channels, various forms of interpersonal communication are used, especially in smaller urban, peri-urban and rural settings. Such activities occur in the oblasts where HWUP works. This includes training of trainer sessions for local educators organized through NGOs, educational sessions, peer to peer communication aimed particularly at youth, and awareness events organized in communities. These interpersonal communication activities also “drive additional traffic” to the website and the hotline where and when accessible. Additionally, information kits for service providers and policy makers are distributed to reinforce the harmonized dissemination of up to date and evidence based information. Materials that had been produced for the previous FP/RH project, Together for Health, were updated with the new canpaign's website and hotline number. The JSI team also revised and updated the training of trainers (TOT) curriculum. For the hotline launch, JSI worked with one of Ukraine’s most well-known experts on developing and operating hotlines. This expert helped develop an operator’s manual, which equips hotline counselors with the most up-to-date medical information and counseling skills. The communication campaign’s website, www.planA.org.ua, was developed in partnership with UNFPA. Research shows that young Ukrainians are the most active Internet users in Ukraine and seldom watch TV or read newspapers. The name of the website, Plan A, is meant to convey that if a person is equipped with all the family planning and reproductive health information they need, there will be no need for a “Plan B” scenario. JSI hired a creative agency to develop the campaign’s public service announcements (PSAs). Two spots were developed (see list of resources below) and both were tested with focus groups before airing. The aim of the first PSA was to start a general FP/RH conversation among society and promote the website and hotline. The second PSA was geared towards youth and their parents. Outdoor advertising for billboards and city lights was developed by the creative agency and based on the first PSA. The actress who portrayed the hotline counselor in the PSA was a real life, hugely popular Ukrainian ob/gyn named Natasha Lelyukh. When her image appeared on the billboards and city lights in central Kyiv, it caused a Facebook flash mob. Trainers Manual for "Grow Healthy"
Didn’t Your Parents Tell You about the Birds and the Bees? The various communication channels used in the national FP communication campaign are monitored in the following ways. SBCC materials are monitored by surveying HWUP’s NGO grantees regarding how much demand there is for the materials among their various constituencies. Feedback received by the JSI team led to developing new kinds of materials, changing existing materials, increasing the circulation of one about FP methods, and reducing the amount of posters in circulation. The trainings of trainers are monitored on an ongoing basis: one out of ten trainings are evaluated by trainees via questionnaires and feedback is used to modify the flow and approach of the trainings for different audiences. Awareness events conducted by NGO grantees are monitored by oblast coordinators on a regular basis and quarterly by the JSI team. The hotline is monitored using the “mystery caller” approach on a monthly basis, which has helped evaluate the hotline schedule, quality of counseling, type of information provided, and from where callers learned of the hotline number (to evaluate the most effective ways of promotion). The website is monitored using web analytics. The PSAs are difficult to monitor because they are broadcast for free and thus analytics are not readily available. Anecdotes from viewers, however, indicate that the messages have been well received. Outdoor advertising, as discussed above, caused an effective Facebook flash mob and was named by the hotline callers as one of the most effective sources of learning about the hotline number. 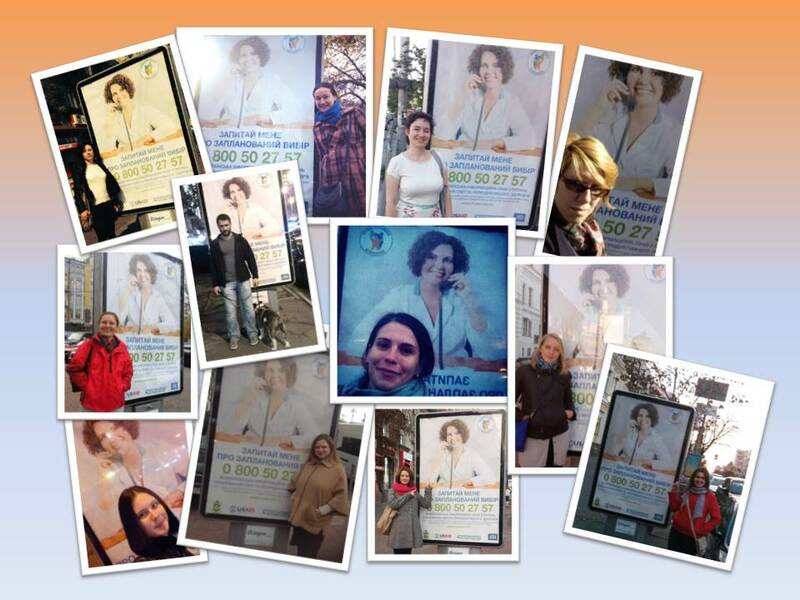 When her image appeared on the billboards and city lights in central Kyiv, it caused a Facebook flash mob: Dr. Lelyukh’s fans began taking their pictures next to the advertising and posted all their pictures to Dr. Lelyukh’s Facebook page (see collage below). JSI contracted with the international research agency IFAK Institut GmbH & Co. in late 2014 to assess the effectiveness of the national FP communications strategy. The purpose of the assessment was to determine audience attitudes and the overall effectiveness of the strategy among target audiences. IFAK collected data by conducted a series of focus groups with HWUP regional partners in Sumy, Uzhgorod, Ternopil, Kirovohrad, Zhytomyr, and Kyiv oblasts. Preliminary results from the assessment show that the national FP communication strategy positively impacted attitudes of target audiences in all areas surveyed. Ukraine’s national FP communications strategy was designed from the beginning to be sustainable due to its emphasis on partnering with government, donors, international and local NGOs. With so many entities owning the process and feeling responsibility for the results, the sustainability of the approaches is increased. The strategy also included building the capacity of the local NGO partners, so that they grow and develop in their knowledge how to implement a multi-faceted communication strategy. The hotline was “owned” by the local Women’s Health and Family Planning Foundation. JSI was contracted through the Healthy Women of Ukraine program to build the foundation’s organizational and behavior change communication capacities. JSI regularly provides technical assistance to the foundation regarding how to improve the quality of the hotline, which is meant to promote the foundation’s ability to keep the hotline running after HWUP ends in 2016. Additionally, the Women’s Health and Family Planning Foundation will administer the Plan A website after HWUP funding ends. The website was, in fact, designed using the platform the foundation uses for other websites it administers. All of the tools created as part of the communication campaign (e.g. IEC materials, PSAs, curricula, hotline, website) will be packaged and made available for further use by both national and regional entities. Finally, because each oblast that works with HWUP created its own regional communication strategy, some of which were endorsed by oblast governments, the opportunities for sustainability are increased. Local ownership is a pre-condition for sustainability. The Healthy Women of Ukraine Program begins. During the first year, the program was implemented in four oblasts (regions): Kirovohrad, Luhansk, Ternopil, and Zhytomyr. Developing a national RH/FP communication strategy is a key objective of the program. HWUP conducted a literature review to gain a full understanding of the challenges surrounding women’s uptake of RH/FP services in Ukraine. A KAP study conducted in 2010 was particularly useful. HWUP also conducted several focus groups and interviews in Kyiv and the regions to round out understanding of the key issues. After gathering background information, HWUP consulted with stakeholders including government and international and local civil society organizations to formulate the strategy’s approach. HWUP presented a first draft of the national RH/FP communication strategy at a meeting of the Kyiv-based Reproductive Health Partners Group. All stakeholders working in the field of RH/FP were present: Ministry of Health of Ukraine, UNFPA, WHO, UNICEF, UNAIDS and others. The strategy was well received and HWUP gathered and incorporated all comments and suggestions into the final version. USAID/Ukraine approves the national RH/FP communication strategy and implementation begins. HWUP updated all IEC materials created during JSI’s predecessor project, Together for Health. The IEC materials now incorporate the life stage approach and other updated RH/FP information. HWUP established a program of mini-grants for local NGOs to implement BCC activities in their respective regions. Seven organizations in four oblasts were selected (Zhytomyr, Kirovohrad, Luhansk, and Ternopil). After conducting trainings-of-trainers and building up a network of trainers, HWUP launched BCC trainings in program oblasts. The trainers conducted up to ten trainings per month in each program oblast throughout the life of HWUP. Four new oblasts joined HWUP at the beginning of the second year. HWUP began rolling out activities in Zakarpattya, Kyiv, Sumy, and Kherson oblasts. HWUP conducted the first RH/FP training for journalists in partnership with UNFPA. HWUP extended its program of mini-grants for local NGOs to implement BCC activities in their respective regions. Seven organizations in the four new program oblasts were selected (Zakarpattya, Kyiv, Sumy, and Kherson). With the launch of the website PlanA.org.ua, Ukrainians can read information about RH/FP and ask any questions online. A link to the website was placed on all HWUP communication and promotional materials. HWUP worked with a creative team to develop the concept for and shoot the campaign’s first PSA. The Ukrainian national council on TV and radio broadcasting confirms HWUP PSA is social advertising, which allows the clip to be broadcast free of charge on select channels and stations. Electronic copies of the PSA are disseminated in the regions via email or DVD. HWUP extended its program of mini-grants for local NGOs to implement BCC activities in their respective regions. Organizations in the three new program oblasts were selected. The second PSA is finalized, burned on DVDs, and disseminated among local partners for further use in regions. HWUP decided to “take the floor” after the parliamentary elections. Political posters needed to be replaced and the advertising market was ready to place social advertising for free. HWUP placed advertising in seven major cities (Ternopil, Chernivtsi, Zhytomyr, Kyiv, Chernihiv, Sumy, and Mykolayiv) with citilights (street posters) and nine cities (Uzhgorod, Ternopil, Chernivtsi, Zhytomyr, Chernihiv, Sumy, Kirovohrad, Mykolayiv, and Kherson) with posters at the pharmacies. 250 posters total were placed. 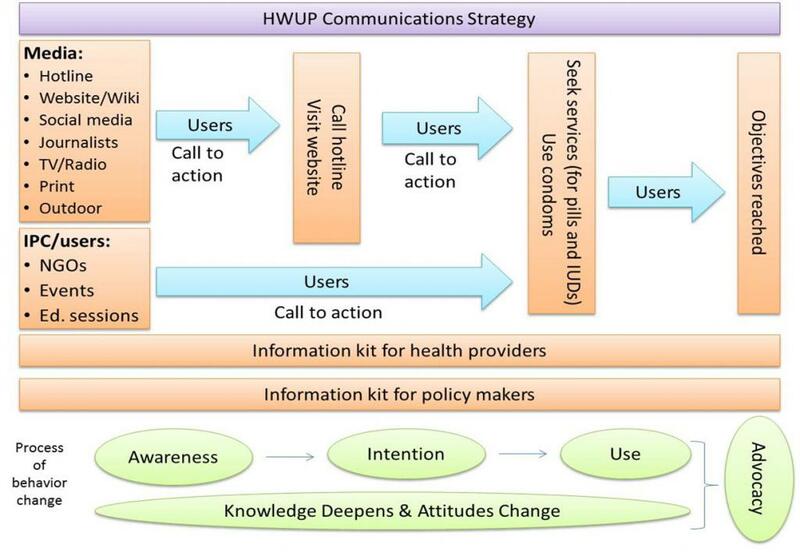 The regional communication strategy...promotes an integrated approach to heighten awareness about RH and FP issues. [It] has a comprehensive vision and specifies the contribution...of each partner. We all know exactly what we have to do in order to contribute to the larger campaign.